What a magical hidden gem! The towers at Ballysaggartmore near Lismore are in an amazing woodland situated on the main road between Ballyduff and Lismore. Take the path to the left from the car park which winds up through the woodland to the towers. You can walk around in a loop lasting no more than 15-20 minutes. Both sides of the path are packed with dense shrubbery and mature trees. There is a picnic area next to the river flowing under the tower bridge. The towers were built in the mid 1800s by Arthur Kiely Ussher who had planned to build a grand house but this never happened. All that now remain are imposing gothic ruins in a wonderful setting. 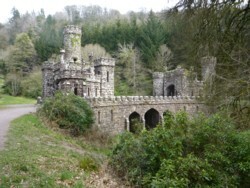 Ballyin Gardens are located on the north bank of the river Blackwater just upstream from Lismore Castle. These gardens are open to the public from 15th April until 30th June and are well worth a visit. The gardens date from at least the early 18th century. The lawns sweep down to the edge of the river and there is a fine selection of stunning mature trees, rhododendrons and azaleas. One Monteray cedar has the largest girth of any tree in County Waterford. Don’t miss these gardens if you are planning a visit to Lismore. I was a bit over enthusiastic when applying a coat of linseed oil to my slate fire place. I had seen the installer apply the oil to make the slate shine and when I tried to replicate his efforts some months later, I ended up with a sticky mess that I couldn’t remove. The best way to remove the gooey mess is with a combination of cellulose thinner and nail varnish remover! Actually nail varnish remover would probably have worked on its own but would have needed a bit more elbow grease as well. Venue: St Peters Church of Ireland, Bandon, Friday, 25th September, 2009 at 9pm. Tickets euro 10. As part of the Engage Bandon Arts Festival, The Film Society in Bandon is presenting Phantom of the Opera (1925) silent film, PG, Black and White to live organ accompaniment by Dr Eric Sweeney. Eric is Head of Music at Waterford School of Technology and is the organist and choirmaster of Christ Church Cathedral, Waterford. He has given recitals throughout Ireland as well as in England, Sweden, Italy, France and American. He is also well known as a composter and is a member of Aosdana. Eric gave an identical performance in Christ Church Cathedral, Waterford at the end of July and both nights were booked out. I had the good fortune to visit Wisley on 1st July. Sprawling over 240 acres, it is just 30 minutes drive from Heathrow and an absolute ‘must go and see’ for garden lovers. It surpassed all my expectations in what it had to offer. Just make sure that you allot several hours for your visit. The gardens encompasses everything from trials fields, a vegetable garden, fruit field, model gardens, wild gardens, walled gardens, lily ponds and arboretum and a recently opened glass house. There are a number of excellent cafes and restaurants as well as a plant centre. I was particularly interested in the perennial planting outside the new glass house. The plants are cleverly grouped together and striking colours such as various types of hemerocallis, blue salvias, campanulas, heleniums, verbascums, geraniums, scabies and euphoria are all used in abundance. I had no idea there were so many varieties of some of these plants. Take a look at some of my photos to whet your appetite! Plastic ain’t fantastic is the slogan of a project by the transition year students at Colaiste na Toibhairte in Bandon. They have produced an excellent bio-degradable bag featuring a heron on the front which is being sold in retail outlets in Bandon for euro 5. Plastic bags are virtually unrecyclable and when they are disgarded, they are often found blocking drains and littering the countryside. Plastic kill birds, livestock, seals and marine life. The waterproof bags introduced by the students are made of bio degradeable hemp and are being imported from India. 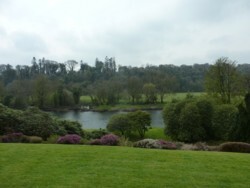 This blog has been posted by Catherine FitzMaurice of Kilbrogan House Guest Accommodation. Starbucks has started marketing its own brand of coffee – VIA which I find somewhat puzzling. However, perhaps it is not so surprising that Starbucks wants a bit of the instant coffee action when you consider that about 80% of coffee consumed in this part of the world is instant and that the total instant coffee market generates about $17bn in sales. The chain hasn’t been faring well over the past year and in January 2009 announced the loss of nearly 7000 jobs plus the closure of 300 more outlets. According to a great article by Christopher Caldwell in the Financial Times lately, Starbucks is supposed to be a chain of expresso shops but in reality turns out a poor expresso and instead concentrates on producing an array of steamed milky concotions at superior prices. A sachet of the instant coffee retails for about $1 which is far from cheap. Christopher Caldwell rightly points out that Starbucks positioned itself in areas with high income, high population and high education but feels that the chain may be challenged in our current economic climate. On a positive note for Starbucks, as people find themselves out of work, they need to be cheered up and often end up at the coffee house. Instant coffee or otherwise, this should be a ray of sunshine for Starbucks in what has been a rather bleak time for this company. I am still happy that my town still has an array of private coffee shops rather than endless chains. a) many of our plants, shrubs and roses were pinched. b) our watering pump blew up in July right at the beginning of a dry period causing many of the plants in the new hanging baskets to die and then have to be replanted. c) the council sprayed the weeds on a windy day killing off many of the plants in our tubs on St Patricks Quay and around the trees on Market Quay, on Kilbrogan Hill and at the top of Ball Alley Lane. We received the adjudication report from the 2008 Tidy Towns Competition. Many of the criticisms were predictable and sadly beyond our control. The derelict petrol station on the Glasslinn Road and the poor state of the Eircom building opposite the station were commented on. I totally agree with their comment that these buildings are eyesores. The derelict buildings next to the new Riverview development on North Main Street also came in for criticism as did the GAA and the graffitti in the childrens playground. I note that the GAA received lottery funding for euro 150,000 so I really hope that a fraction of this amount (maybe even just euro 20) will be set aside for some paint to spruce up their gates. Just a small job like that could make such a difference to the town.